The event will be held at 11 a.m. Tuesday in Room 3216 in the Palumbo Academic Center. 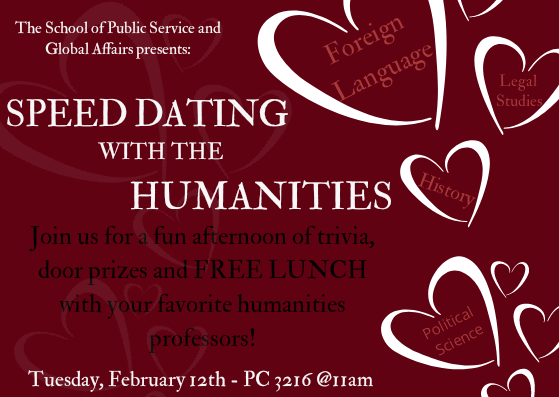 All PSGA, history, political science, legal studies and foreign language majors are invited for an afternoon of trivia, door prizes and free lunch with their favorite humanities professors. As part of the event, they will have a special “Tinder” section where students will “speed date” each professor. Lunch will be provided and Valentine’s Day prizes will be raffled. This event will be an opportunity for students to meet professors and other students in similar majors. This is the debut event for the PSGA, where history, political science, legal studies and foreign language majors are united under one school instead of individual branches. These majors all have commonalities; this school creates a community that maintains their individual identities. It offers a welcoming atmosphere for intellectual, curious students to thrive in and out of the classroom. The school will continue to host new events to foster a new sense of community and unity the humanities have lacked in past years. Another example is the monthly Politics and Pints event, where students gather in a local bar and discuss currents events, play trivia and enjoy free appetizers every Tuesday led by the PSGA co-director Jeff Bloodworth, Ph.D., and Peter Agresti, Ph.D., program director for legal studies. Bloodworth, co-founder of the school, said that this event is so that students can have fun and get to know the faculty more. “It is to create a community with students and professors,” Bloodworth said. Agresti describes Politics and Pints as a civil gathering where students can express their political opinions in a respectful environment. 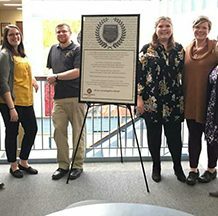 “It is a great event that presents a way for students to be able to sit down and converse civilly about matters that are important to them,” Agresti said. Randall Sutter, a freshman PSGA major, said that his experience helped him meet people from across campus and make connections that probably wouldn’t have occurred without events like Politics and Pints. “Politics and Pints is a great way to learn a little, enjoy free food and get to know kids in your major or similar majors,” Sutter said. “I can’t help but feel that as humanities majors, we do not interact across disciplines. Chole Kernan, a freshman PSGA major, said that although it is such a diverse group of people, we all strive toward a common goal. “We’re kind of the Breakfast Club,” Kernan said. “We’re all from different places and have different personalities, but we all have the same interest: to get involved and educated on current events and world issues. Ultimately, PSGA is eager to share all the resources and benefits it has, and students are as excited to form part of this new family.